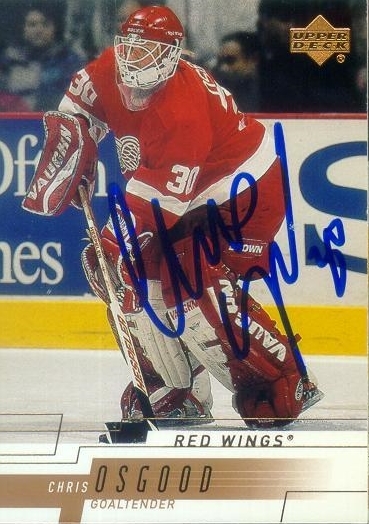 Chris Osgood, Hockey Hall of Famer? What do you think of when I mention Chris Osgood? What is his trademark? Me, I think of the plain red Bauer helmet he’s played with his entire career — no fancy paint job for Ozzie. Of course, Osgood has three Stanley Cup championship rings, including two as a starter with the Red Wings — and he’s making some pretty good headway toward another. You might be surprised to know that the 36-year old netminder has quietly built up a pretty impressive resumé over his 15 NHL seasons, and stands among some pretty heady company among the game’s all-time goaltending luminaries. Osgood is signed with the Wings through 2010-11, so he will almost certainly finish his career with more than 400 victories. Right now he stands at 389, which places him 11th all-time in NHL history — in any era. He’s won 27 and 26 games, respectively, over his past two seasons with Detroit, so I don’t think it’s too presumptuous to put him down for 25 each over the remaining two seasons of his current contract. That would give him 439, which would bump him up to sixth place all-time — assuming he doesn’t play beyond his current deal. But that’s not all. His 2.47 career goals-against average ranks fifth in NHL history among goaltenders with at least 500 games played, and his .906 save percentage ranks 11th. How about the playoffs? As I mentioned earlier, he’s got three rings total, and two as a starter. His career numbers for wins, shutouts, goals-against average and save percentage all rank in the top 10 all-time: He has 68 wins (ninth all-time); 14 shutouts (sixth); a 2.14 average (sixth among goalies with at least 50 games played); and a .915 save percentage (10th). Entering this year’s playoffs, the biggest question mark for the Red Wings was their goaltending, as it was last spring. Osgood essentially split starting duties with Ty Conklin in the regular season, and his stats for 2008-09 were rather mediocre. There was some doubt as the regular season crept to a close as to whether Ozzie would draw the starting gig in the postseason, or Conklin. But give credit to Wings coach Mike Babcock, he knows that when the money is on the table, Osgood is his man. And Osgood has delivered. He’s won 10 games so far, and posted a solid 2.32 GAA and .925 save percentage. If he finishes his career with three rings (or more?) as a starter, with those kind of numbers, how can you possibly build an argument against Chris Osgood as a Hall of Famer? • One of the biggest factors in the Red Wings postseason success over the past decade and more is the contributions they invariably seem to get from their role players. Guys like Darren McCarty, Martin Lapointe, Larry Murphy, Igor Larionov, Tomas Holmstrom and Slava Kozlov (among others) were instrumental to the 1997 and ’98 championship squads. Detroit is the best at getting contributions from everyone when the games mean the most. Last year, Johan Franzen emerged as more than a secondary scoring option in the playoffs, potting 13 goals, tied with Sidney Crosby for the league lead, and five game-winners, after scoring 27 in the regular season. He’s got nine in the playoffs so far this spring. The biggest hero to emerge from seemingly nowhere in 2009 — especially over the past week or so — is Daniel Cleary. The former Blackhawk now has four goals over his past three games, and leads all players in the playoffs with a plus-13 rating. Cleary’s goal that gave the Wings a 2-1 lead in the second is a perfect illustration of why the Wings are so lethal this time of year: They are the best at making teams pay for their mistakes. Brent Seabrook wound up to take a slapshot from the point but instead shot right into Cleary’s equipment. From there, it was simply a matter of Cleary winning the race to the puck, and the next thing you know he was loose on a breakaway, made an effective but simple deke to beat Nikolai Khabibulin on his blocker side and that was it. Mikael Samuelsson is another example, as he’s now scored the game-winning goal in each of the first two games of the series. • The Blackhawks played much better in Game 2 then in the opener, outshooting the Wings by a slight 39-38 margin, and they probably deserved to win. Jonathan Toews scored both of Chicago’s goals, and both could probably be described as “ugly” scores. His first marker came on what was probably intended as a centering pass for a teammate, but instead it bounced off Jonathan Ericsson’s skate and past Osgood for a 1-0 lead. On his second goal he camped out in front of the net and stuffed home a rebound off a Kris Versteeg shot from the point. Toews’ playoff beard is starting to grow on me. He looks kind of like a Civil War general. There was no resolution to the Coyotes bankruptcy situation to come from Tuesday’s hearing, and the judge overseeing the case ordered the two sides to mediation. The main question as judge Redfield Baum sees it is whether the team should be allowed to move to Hamilton, Ontario — a solution the NHL claims is a logistical impossibility for the 2009-10 season with only four and a half months before opening night. • The OHL’s Windsor Spitfires won their first game at the 2009 Memorial Cup, handing the WHL’s Kelowna Rockets their first loss. That means with one game to play in the opening round robin, all four teams are alive for the championship. The two QMJHL teams — the host Rimouski Oceanic and playoff champ Drummondville Voltiguers — play tonight, with the winner basically getting a “bye” into the semifinal. The loser of tonight’s game will play Windsor on Thursday night, and the winner of that game will play the winner of tonight’s game Friday. Kelowna awaits that entire mess to sort itself out, and they’ll get whoever’s left standing in the title game Sunday. • The Houston Aeros visited Winnipeg for the first two games of the AHL’s Western Conference Finals, with the host Manitoba Moose holding serve at home. The Aeros then lost Game 3 at home Monday, and face elimination when the two teams play Game 4 at the Honda Center in Houston tonight. The Moose will be trying for their 11th consecutive victory of these Calder Cup Playoffs. In the Eastern Conference, the Hershey Bears and Providence Bruins split the first two games of the series in Hershey, and will play Game 3 on Friday night.